A Kansas City native, Lynn Jacobs has always had the desire to travel. As a teenager, Lynn took her high school’s motto “Yes I Can” to heart. Denied entrance to an airline stewardess training school (she did not meet the height requirements); Lynn decided to take another avenue to travel. Lynn went to work for Southwestern Bell Telephone Company which offered the opportunity to transfer to Pacific Bell Telephone Company in Los Angeles. The customer service and sales training she received at the phone company gave Lynn the discipline and foundation needed for her future careers. Lynn later joined a successful mentoring and training organization within Pacific Bell called C.I.T.I.E.S. With more than 13 years in communications, Lynn found the strength to leave the comfort of a salaried job and become a successful real estate agent and manager for Seibu Realty Company. Opportunities for advancement led Lynn away from Seibu Realty to Rainbow Estates Realty. Together with her husband/ broker, Henry Jacobs, they expanded their company “Rainbow Estates Realty” to include a property management department and a REO liquidation department. After a lucrative career in real estate, Lynn decided to finally pursue her dream to travel. Lynn got her “wings” when she joined Northwest Airlines as a reservation sales agent. While at Northwest Airlines, Lynn took full advantage of the travel benefits and traveled to destinations that she had only read about in geography classes. When Northwest Airlines closed its Los Angeles area reservation office, Lynn’s “wings” were clipped. A new career was needed and the solution was obvious. Lynn enrolled in one of the top travel schools in the nation, West Los Angeles College, and began this fascinating chapter of her life. In 2006, Call Lynn 2 Travel (CL2T) was born. Her vision was finally complete. Lynn’s life and love for travel explains why she chose to give her company a log line that encouraged others to also “Stop Dreaming….Call Lynn 2 Travel. Paula Mitchell Manning is manager and co-owner of Call Lynn 2 Travel. Paula’s background as a writer and producer has helped her bring a unique blend of energy, creativity, persuasiveness and entrepreneurship to her new passion, selling travel. 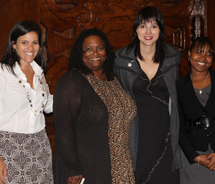 Manning is the Los Angeles Chapter Director for OSSN (Outside Sales Support Network.) Her leadership skills and singular approach to staging events ---including three seminars at sea programs for OSSN--- have already earned Paula significant recognition in the travel industry. Paula is a three time nominee and two-time winner of TravelAge West Magazine “Trendsetters Award” and was profiled by that publication in a cover featured article. Paula is currently focusing her efforts on group departures and cruise sales. She lives in Los Angeles, California. CLIA Accredited Cruise Counselor (ACC): Currently working on her Masters Cruise Counselor (MCC) credential. Successfully completed specialist programs from Carnival Cruise Line, Celebrity Cruises, Crystal, Cruises, Disney Cruises, Holland American Line and Royal Caribbean International. Served two terms as past board member for the Company of Angels Theatre. Received a Certificate of Recognition from the California State Assembly and the "Above & Beyond" Volunteer Award for her work with Aid for AIDS. Recipient of the City of Los Angeles Certificate of Appreciation for service to the Shaping Black Culture in the Diaspora and International African Diaspora Day. Our OSSN Seminar at Sea was poetry-in-motion, and it was because as a GROUP we all shared. The group consisted of 34 agents and companions with the perfect mix of "seasoned pros," "newbies," and non-travel industry companions. Thanks to the group’s openness, candor, and willingness to trust, everyone (agent and non-agent companions) walked away with new information, ideas and contacts. The objective of our first day was for us to discover innovative ways to identify new group business and sell them the Celebrity Alaska Cruisetour product. We began with an Elevator Speech Contest. The attendees were given 30 seconds to introduce themselves and make us want to take their business cards – and use them. Within our group, we had agents who specialized in horticultural travel, African cultural travel, large-family vacations, China, and European river cruises, among other niches. As each attendee or companion took center stage, we all found ways to improve our own introductions. During our OSSN Benefits and Services presentation, a couple of our members shared how they use OSSN’s extensive website to help them build their business. Several members explained to us the Group Cruise and Tour Marketplace tool and showed the way they used it to save their TCs and/or amenities when they were short by a few cabins/rooms. We learned how TRUE gave a number of members the means to gain their independence and allowed them to open their own agency. Using the Selling Groups 101 PowerPoint presentation as a guideline, we did an overview of group sales. This section of our training turned into an electrifying and enlightening exchange, as our “seasoned pros” found new and innovative ways to attract group business while our “newbies” learned how to polish their approach from their travel veteran peers. We then had an intensive training of the Celebrity Alaska Cruisetour product. 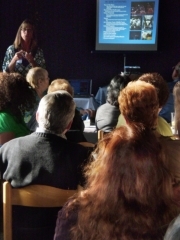 Thanks to several attendees, our Celebrity Alaska Cruisetour video and PowerPoint presentation was accompanied by a spirited exchange of information about the Celebrity Cruisetour product. Luckily, we had agents with firsthand knowledge of Celebrity Alaska Cruisetours, while others had taken a competing cruise line’s Alaska Cruisetours. The input by our attendees allowed us to compare the two cruise lines and deepen our training experience. You’ll be impressed to hear that Celebrity was shown to offer a fantastic Alaska Cruisetour experience. We ended our all-day training by breaking into four groups, and each was given the same newspaper and Celebrity Cruise materials. With the clock ticking, the final contest began, and there were two categories to win the contest - the most potential cruise groups found in the newspaper and the most innovative presentation. I purposely made sure that friends and spouses were on opposing teams. It was wonderful to see the various teams work together to prepare for the final presentation. We wound up having a winner for each contest category. The day ended with wine being served at dinner, great stories to share, and new bonds made within our group. On our other sail days, we had private ship tours set to help us learn more about the Celebrity Cruise ship “Mercury.” We had the following tours: Backstage Tour, Bridge Tour, Galley Tour, and Spa Tour. We also had a visit from Future Cruises to explain Celebrity’s new future booking policy to our group. While in port at Sitka, Juneau, and Ketchikan, I had the pleasure of being invited by one of our agents, Janette Jahoda, to meet with the tourism board for Sitka and Ketchikan. This meeting proved to be one of the most educational experiences of the trip for myself and my business. Please take a moment to look at the pictures with this article. In Sitka, we learned that Tribal Tours, a company that uses locals to conduct tours, offered off-the-beaten path experiences. In Juneau, we rode the tramway to the top of Mt. Roberts. In Ketchikan, we met with the tourism board and rode the FREE shuttle around town. For $1, the local bus will take you to many of the sites so you can to rub elbows and enjoy the flavor of the local town’s people. If you ever find yourself on a cruise to Alaska, do take the time to contact the local tourism boards. It’s a great way to build your business and expand your knowledge of this beautiful locale. I’d like to thank Celebrity Cruises and the dedicated staff and crew of the "Mercury." What I admire about the travel industry is how we “travel professionals” are always open to learning, so thanks also to our amazing Seminar at Sea group attendees for living up to my admiration of travel professionals. I also appreciate OSSN for continuing to offer its membership the opportunity to explore and experience our allied supplier members' products. Our arrival-night cocktail party allowed us to meet in a very relaxed atmosphere. Carmela Tarce and Sharon Oberritter shared ideas as they prepared for team presentations. Suzzette Baumann won our Elevator Speech Contest. OSSN was given a private tour of the dressing room areas during our backstage tour. Four Celebrity "Mercury" performers did a Q&A for OSSN during our private backstage tour. We enjoyed our peek behind the culinary scenes during this tour of the ship's galleys. We were amazed at what it takes to run a cruise ship while we toured the bridge of the "Mercury." Here's our ship docked safely in Ketchikan. This injured eagle and other birds have found safe haven at the Alaska Raptor Center. is where you can catch the local bus and free shuttle. You'll find this totem pole in front of Sitka National Park. Sheet'ka Kwaan Naa Kahidi Community House. when she was shot looking for food for them. Paula learns how to stay warm with Celebrity's special blend of hot chocolate. Notice that she's the only one without a coat! 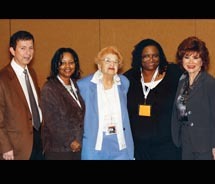 Paula Mitchell Manning serves as the director of the OSSN chapters in Los Angeles and Orange County. You can reach her via her listing on the OSSN Chapter Directors Roster. Last month, approximately 50 members from the OSSN So Cal Chapters came together for a high tea banquet, meetings, seminars and a tour of the Queen Mary in Long Beach, Calif. The staff of the Queen Mary — including Nicole Campbell, the express meeting manager, and Will Cayne, the "captain" of the ship-turned-hotel — gave insight into the Queen Mary's storied past. Travel agent members of four Southern California chapters of the Outside Sales Support Network (OSSN) gathered together to attend the third annual OSSN SoCal Hands-On Training Day. Held at Morongo Casino Resort & Spa, in Cabazon, Calif., on Jan. 25, the event connected 50 OSSN members and 25 travel vendors for a day of online training and networking. The Los Angeles and Orange County chapters of the Outside Sales Support Network (OSSN) held its May meeting at George’s Greek Cafe in Long Beach, Calif. The seminar, which was jointly sponsored by OSSN and co-sponsored by Pleasant Holidays and Hyatt Resorts & Spas Hawaii, welcomed 28 agents from around L.A., Orange County, San Diego and the Inland Empire. Kathy Schugg, regional sales manager for Hyatt Resorts & Spas Hawaii presented an overview of the newest offerings at Hyatt’s three properties on the islands: Hyatt Regency Maui Resort & Spa, Grand Hyatt Kauai Resort & Spa, Hyatt Regency Waikiki Beach Resort & Spa. In addition, Adriene Xerri, business development manager for Pleasant Holidays brought agents up to date with Pleasant's new products, including its new U.S./Canada brochure. Agents were also presented with a social networking training seminar, where they learned how to utilize Facebook, LinkedIn, Twitter and other online products to grow their business. Can you think of a better way to experience an OSSN Seminar at Sea FAM cruise than to be on the Royal Caribbean International ship "Radiance of the Seas" during the Halloween weekend? And, this event offers you an optional feature – an opportunity to participate in a "Whodunit Mystery Theme Cruise." On Thursday, Oct. 29, through Monday, Nov. 2, OSSN is offering you a Seminar at Sea FAM cruise of a lifetime. The "Radiance of the Seas" departs San Diego, Calif., on this voyage. If you have not experienced the Royal Caribbean brand before, then this is the perfect introduction. The OSSN Seminar at Sea FAM Cruise begins with a hosted cocktail party – those participating in the optional "Whodunit Mystery Theme Cruise" can come dressed as your assigned character. It's a great chance for you to begin the mystery and try out your character among friends. There will also be a surprise or two at the cocktail party – it's Halloween Weekend, and anything can happen. How many times have you walked down the well-designed corridors of a beautiful cruise ship during a ship inspection and imagined yourself sipping cocktails in one of the luxury suites? I remember being so overcome by the elegance of one ship that I checked my credit card balance during the gourmet lunch to see if I had enough to purchase a stateroom.